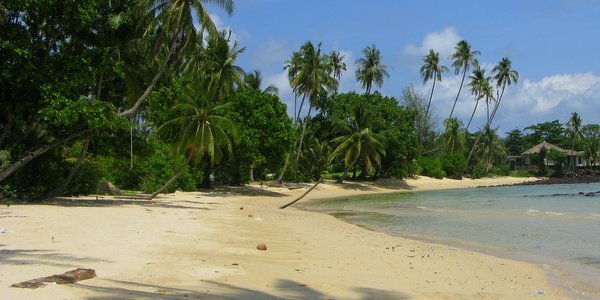 Ao Kao, in the south west of Koh Mak, is a beautiful long beach, with resorts sitting just back from the powder sand and restaurants and bars grouped together on the main road which runs behind it. The clear turquoise sea is perfect for swimming and the islands of Koh Rayang Nai and Koh Rayang Nok, which lie just a little way offshore, are within a gentle kayak distance. Reached by a small track running off Ao Nid road, the most southerly resort is Lazy Days Resort and continuing along the sand, you’ll find one of the island’s largest resorts, Ao Kao Resort. The family friendly Palm Beach Resort and the traveller’s favourite, Island Huts sit next door, and between them all, they share one of the best stretches of beach on Koh Mak. Access to Ao Kao Resort and Palm Beach Resort is off the main road by Hongthong Koh Mak Muay Thai, Coco Cafe and Koh Mak Pizza, while you can get to Island Huts, by turning in just after the tiny European restaurant at Swiss Sawasdee, complete with its own gym. You can also connect from one access road to the other. Cafe Del Mak, Island Shop, great for those last minute gifts, the long established Koh Mak Divers, Q Bar and a couple of minimarts are also in this vicinity. Koh Mak Garden is the impressive villa about 100 metres back from the road. A longish stretch of undeveloped beach follows, which the road reflects, as it cuts through flat land planted with rubber trees before doglegging right back behind the sand after the minimart. Monkey Island Resort begins this next section and just a short hop from the sea, there is a row of popular restaurants and cafes, Table Tales, Kon Gin Sen, Food Garden and the western style, Food Art Cafe. Seatales Speedboats also have an office next door to Table Tales. Within Monkey Island, down by the sea, you’ll find its own Monkey Bar, the main focus of Koh Mak’s nightlife. If you are staying at the Ao Kao Resort end, it’s a good 15 minutes walk along the road to here, less time if ambling on the sand, but you will get wet if the tide is high. Either route, do bring a torch in the evening as Koh Mak does not go in for too much street lighting. In the central area of Ao Kao, Riverside sits by the creek on one side of the road, with Ball Cafe and Joe’s Corner Hostel, while Baan Koh Mak and the bigger, more hotel-like, Makathanee Resort line the beach side. Both BB Divers and Koh Mak Divers also have offices in this stretch. Makathanee Resort has its own pier, which is used by Leelawadee Speedboats, coming from the mainland and Kai Bae Huts Speedboats, coming from Koh Chang, Koh Wai or Koh Kood. Next to this section and just a few hundred metres further down, you’ll find the final set of restaurants including Rabbit Bar, Aimmy and Clay Pot, as well as the office for Totti Boat Trips, snorkeling tours out to Koh Rang. All in all, the atmosphere throughout these parts is extremely laid back, with traffic at a minimum. It’s perfect for an evening stroll to choose where to eat and where to kick back with a drink. At the back of Makathanee Resort you can pick up the road that leads to the other coast at Ao Suan Yai, home to Koh Mak Resort and Seavana Resort. Along this connecting road, at the start, the long stay houses of Koh Mak Living sit behind its seafood restaurant, while two cheap diners, Pim Jai and C’est Bien face each other just a little further along. Koh Mak Disc Golf has its large playing area under the trees here, before you reach another cheap restaurant, Mam’s and the live music bar, Artists’ Bar. The back entrance to Good Time Resort completes the lay-out running up to the steep hill which brings you out at Thaidaho Vista and Islanda Resort, with their magnificent views out over the bay beneath to Koh Kham. Cococape is also building new accommodation in the area. At this crossroads, with Thaidaho Vista straight in front, you can bear right to ultimately pick up the sandy track that winds its way behind Seavana Resort and Koh Mak Resort to the pier on Ao Suan Yai or go left, with Cococape Resort and the route to Laem Tookata at the end. 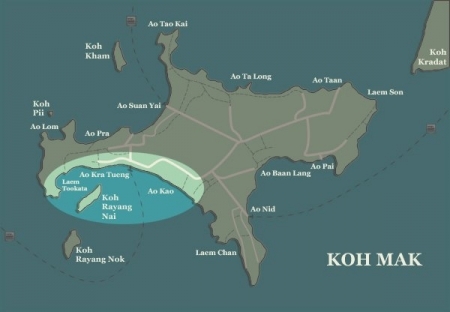 Allow about 20 minutes to walk between the Ao Kao Beach and Ao Suan Yai Beach. After Makathanee Resort, the beach becomes know locally as Ao Kra Tueng. TK Huts, Baan Chailay, Sky Beach Resort, Holiday Beach Resort and Big Easy are the final resorts on this stretch of sand, a stretch which, like that near Ao Kao Resort at the other end, is one of the best on the island. Just after Zabmak restaurant and Chill Cafe, the road behind Makathanee offers up a handful of bungalows at 2 Cans before snaking inland past a few holiday homes and ultimately reaching the track down to Holiday Beach Resort or one that goes straight on, giving access to Big Easy, but no further. Continuing along the beach, it is possible but very tricky to walk from Big Easy to the next bay and then onto the next one after that, where a house is clearly visible as you set out. That house is at the start of Laem Tookata, a charming little cove which is home to three old style backpacker bungalow operations, Baan Ing Kao, Baan Laem Tookata Beach and Ma Ruay. The views across to Koh Rayang Nai and Koh Rayang Nok are superb. To reach here by motorbike, far easier than going by the beach route, follow the road to Cococape Resort as described above, veer to the left at its entrance and then gently cruise over a few kilometres to the very end. You will pass above Ao Pra beach, where the new boutique resort, Mira Montra, has now opened, as well as the back of the rental villa, Koh Mak Residence. Laem Tookata, incidentally, makes a terrific stop for some lunch.